The Microwave Site Master S820E family with frequency options covering 1 MHz — 8, 14, 20, 30, and 40 GHz, is the world’s most advanced Site Master ever developed. Available Vector Network Analyzer (VNA) and Vector Voltmeter (VVM) options allow users to easily expand the S820E’s versatility at any time. 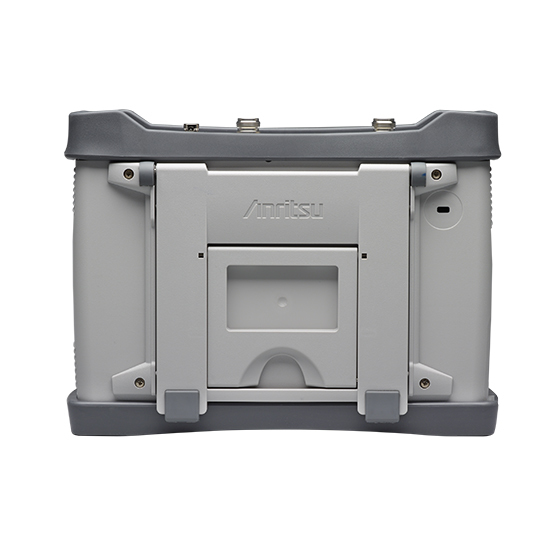 Adding options to the S820E is hassle free, simply purchase the desired option(s) and install the option activation key(s) provided by Anritsu. No need to send the instrument into a service department because all hardware and calibrations required are already built into the S820E before it leaves the factory. The S820E is the highest value handheld microwave analyzer in its class, providing more standard measurement capabilities than any other similar type of product on the market today. 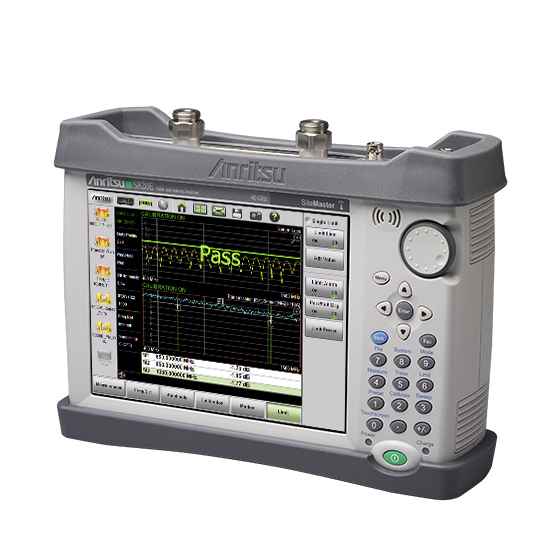 Now including standard Video Inspection Probe (VIP) Mode (firmware version V1.17 or greater) users can now verify fiber connectors and perform Pass/Fail testing as per the IEC 61300-3-35 standard, in addition to the traditional coaxial/waveguide measurements already supported by the S820E. All that is required to inspect fiber connector ends is an Anritsu compatible USB Video Inspection Probe (sold separately) such as the G0306A 400x USB VIP. VIP results may be saved as image files, measurement files, or turned into pdf reports directly from the instrument itself. 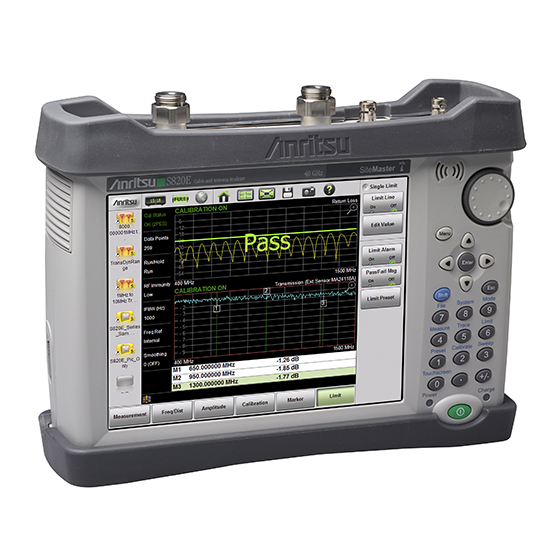 Measurement files obtained with the S820E VIP Mode are fully compatible with Anritsu’s wireline optical test products such as the award winning MT1000A Network Master Pro, MT1100A Network Master Flex, and the MT9000 series of OTDR products. VNA mode provides fully reversing sweep, 4 S-Parameter simultaneous measurement capabilities with user configurable quad display. Generates standard industry compatible format S2P files (3 types of S2P files are available). S2P files can be imported into Anritsu benchtop VNA’s (VectorStar™ and ShockLine™) for ease of comparison between field and lab measurements. VVM Mode with A/B and B/A Ratio capability enables the S820E to be used as a drop-in replacement for older legacy Vector Voltmeters. VVM Mode also supports Reflection/Transmission measurements directly, which eliminates the need for an external CW source, and external couplers, bridges, or splitters. Vector Error Correction can be applied to the Reflection or Transmission measurements, which provides absolute measurement data for the DUT, as well as compensating for any cables, adapters, or fixtures that might be required to connect directly to the DUT. Multiple measurement display modes are available to facilitate easy comparison with other common measurement types, and a handy Table Display allows simultaneous measurement of up to 12 DUT’s and 1 reference, extremely useful for multi-array antenna system tuning. The industry leading dynamic range provides excellent measurement stability and repeatability where high system losses are unavoidable, making it ideal for critical glide slope installation and verification. Utilizing the same advanced sampler technology used in our premium VectorStar™ VNA models and our newest ShockLine™ VNA models. The S820E delivers benchtop microwave performance in a compact handheld package. No other handheld microwave cable & antenna analyzer/vector network analyzer available today can match the dynamic range performance of the S820E models. With 110 dB of dynamic range up to 40 GHz, the S820E even surpasses the performance of older generation benchtop VNA’s. Modern connectivity options (USB, Ethernet) are standard as well as full remote control capability. The S820E replaces the former S810D/S820D microwave cable & antenna analyzers, and provides all of the capabilities of those models plus more. The S820E also includes “Classic Mode” which allows former users of the S8X0D series to become immediately productive with a minimal additional effort. A built-in help menu provides easy access to help and also includes the full instrument user guide. Transmission and 2-port swept cable loss measurements using an external USB sensor allow users to accurately measure loss in long cables and waveguide assemblies where each end of the assembly is far away from each other. Sensors may be extended up to to 85 m (278 ft) using the Anritsu USB Extender (2000-1717-R) and a suitable length of UTP Cat 6 cable. Anritsu offers a 22.5m Cat 5e cable (2100-28-R) to satisfy most application requirements. Patented RF interference rejection enables accurate measurements in the presence of high RF activity. Both coaxial and waveguide measurement types are supported. 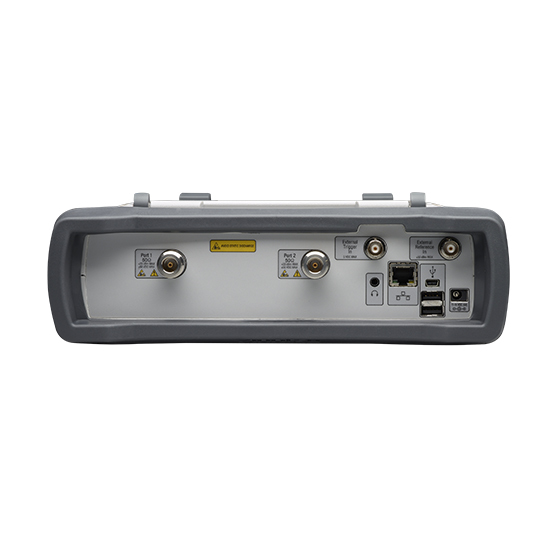 Designed from the ground up to provide cutting edge performance, the architecture internally is a 4 receiver fully reversing 2-port vector network analyzer. This architecture allows for future upgrade options which will further extend the instrument’s powerful capabilities, future-proofing your investment for many years to come. Line Sweep Tools (LST) is a free data analysis software utility that enables assessment of system trends, problems, and performance in addition to professional report generation.